I tried to make your strange American casserole and it gave me botulism and made me incredibly fat. Litigation will follow……. I do agree that Simon Cowell’s title of ‘talent spotter’ is ironic at best and blasphemous at worst. I’ve tried to spot some talent on him and I couldn’t find a trace. The famous George Bernard Shaw line “those that can do and those that can’t teach” seems appropriate for him a vague and ambiguous manner. thanks for the lovely article……it was really nice to see that someone really enjoyed the whole simon head in a bad bit. Basically i had no intention of making the head until the show producers begged me to……so in the end i said yes……i figured if i went down in flames with the singing at least i would have a polite way of making fun of simon…..i’m not exactly a fan of the man but after meeting with him and realising he had a sense of humour about it all i kinda like him now…..he’s well very down to earth i will gladly send you pics of the models and also show you the link on youtube…….hope it made you laugh…….it was nice to get a bit of comical revenge on them……..all the best for christmas and new year your friend Russell. Russell, you are ace! Thanks for reading the post. Your head-sculpt was my fave moment of this series. I’d love to see pics of the sculpt and video. I couldn’t believe that no one had other pics posted for me to swipe and enjoy! Happy Holidays! HOPEFULLY THIS LINK WILL HELP YOU FIND THE YOUTUBE VIDEO OF THE CLIP AND THE OTHER JUDGES HEADS…….. Thanks so much for sending! I’ll use the link to put an update in the post! Can’t wait to take a look. AND I HOPE THIS LINK WILL TAKE YOU TO MY FACEBOOK WHERE YOU CAN SEE THE OTHER PICS OF THE HEADS….IF NOT I WILL GLADLY EMAIL THEM TO YOU WITHOUT HESITATION……MY EMAIL ADDRESS IS HERE FOR YOU IF YOU SHOULD NEED IT…. Wow. First Paula goes and now Simon is on his way out. I wonder what’s going to happen to American Idol. 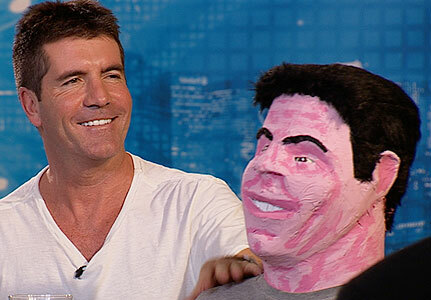 I wonder if it will still be as popular without Simon. I think he is a very big part of what made the show successful. Dude, I’m not so sure what to think. I mean, does America need both Idol AND X-Factor? I’m not convinced.